The roots of generosity among Iowans run deep. 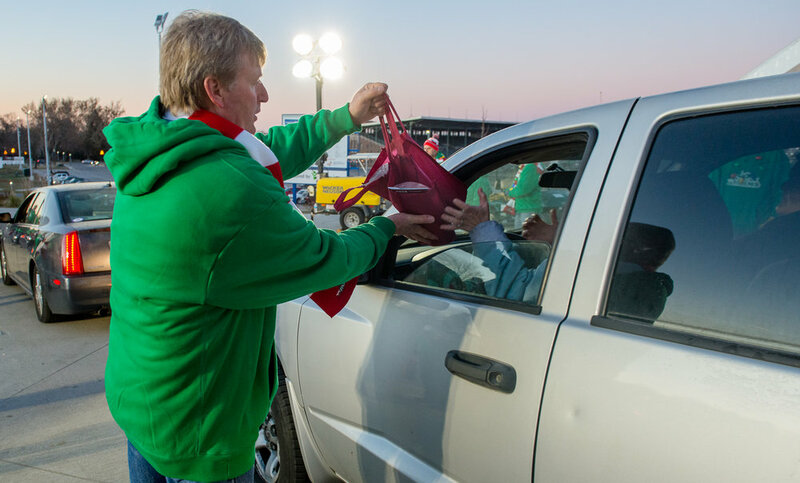 From the Mississippi River to the Missouri River and every county in between, our state’s residents, communities and businesses embrace the spirit of giving. It’s something Iowans do with pride throughout the entire year, but during the holiday season, the seeds of compassion become even more abundant. Here’s a roundup of how several Iowa Food & Family Project friends and partners spread good tidings to those in need. Please note, by clicking the links, you will be leaving a partially funded checkoff site. Katie Hyde purchases milk with employee donations from the Iowa Department of Agriculture and Land Stewardship’s “10 Gallon Challenge.” Photo credit: Iowa Department of Land Stewardship. 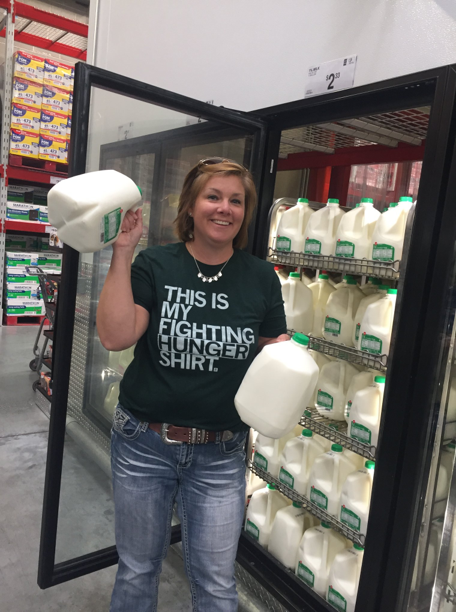 Tapping into the power of social media and wanting to help “moo-ve some milk” off store shelves, Ty Higgins, a Wisconsin Farm Broadcaster, developed the “10 Gallon Challenge.” His goal was to benefit struggling dairy farmers – including those in Iowa – and provide food for local families in need. Many family-owned dairy farmers are facing hard times due to many factors out of their control, including low prices and shrinking demand from consumers purchasing non-milk alternatives coming from almonds or coconuts. Due to these challenges, Iowa has recently lost approximately 80 of its 1,360 dairy farms. Across the U.S., nearly 97 percent of dairy farms are family-owned operations, so the downturn’s impact is felt across communities. Higgins created a Facebook video in August, which has since been viewed 190,000 times. The video encourages consumers to purchase 10 gallons of milk to donate to their local food pantry. Food pantries report that one of the most requested foods is fresh milk. However, because it’s perishable, it's often a lesser-donated food staple. From the Hawkeye Wave – a childhood cancer awareness initiative at University of Iowa football games – to the ALS ice bucket challenge – to the “Movember” campaign to raise awareness of cancer in men, social media’s power is in message amplification. The “10 Gallon Challenge” has momentum. Organizations across Iowa are raising money and sharing photos with the hashtag #10gallonchallenge. Recently, Iowa Department of Agriculture and Land Stewardship staff raised money to purchase and donate 65 gallons of milk, surpassing the modest 10-gallon goal. Via social media, they showed the cumulative impact simply giving one gallon of milk per person can make in others’ lives. Iowa is home to a staggering and perhaps even surprising statistic. One in nine individuals struggles with food insecurity, and one in six of those people are children. In Polk County alone 53,650 individuals are food insecure and 18,550 are children. Food insecurity can mean different things. It may mean you don’t know where your next meal is coming from or maybe you have food for breakfast, but nothing for lunch or dinner. The Food Bank of Iowa serves more than half of Iowa’s 99 counties. Partner agencies and programs help friends and neighbors in need through food pantries and meal sites. Each month, the Food Bank of Iowa distributes approximately 1 million pounds of food. To fully meet the hunger needs in our state, nearly 2 million pounds of food are needed each month. During the growing season, fresh produce is always a welcome donation. Some of Iowa’s farmers grow food specifically to give back to communities. For example, for the past several years, the Van Manen Family Farm in Kellogg has grown sweet corn for the Food Bank of Iowa. Monsanto donates the seed, and the Van Manen family does the rest. Another area farmer plants nearly a dozen acres solely for food donations. “Through my interactions with Iowa Food & Family Project events, I have heard from many farmers who donate directly to food pantries in their area – from fresh produce to pork, eggs and turkey,” says Emily Shearer, food acquisition coordinator for the Food Bank of Iowa. 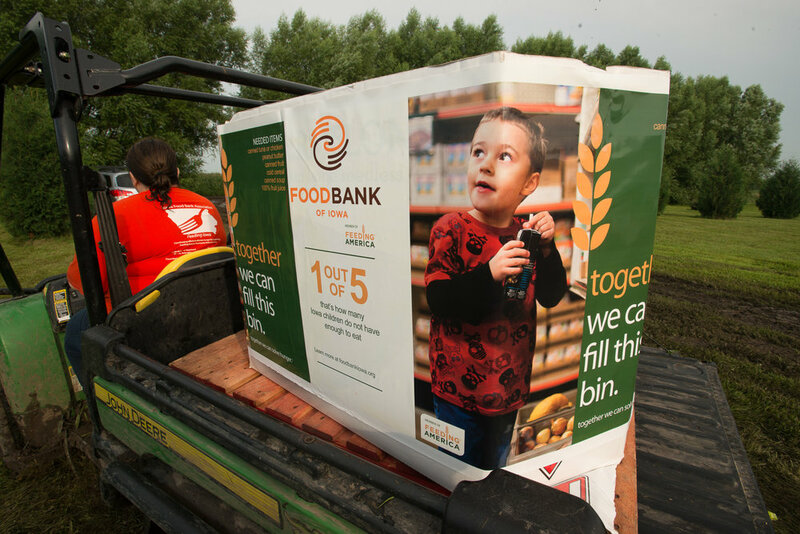 This year, the Food Bank of Iowa has set a fundraising goal to supply 300,000 meals to food- insecure Iowans during their largest food drive – Combat Hunger. The effort runs through mid-November, although donations are accepted throughout the year. Iowa Select Farms is the largest pork producer in Iowa and is committed to responsibly producing safe, nutritious and high-quality pork for their customers. The company annually produces more than 1 billion pounds of pork. Iowa Select Farms is one of the leading economic engines to Iowa’s rural communities, employing more than 1,200 people, contracting with more than 650 farmers and supporting hundreds of local businesses throughout the state. 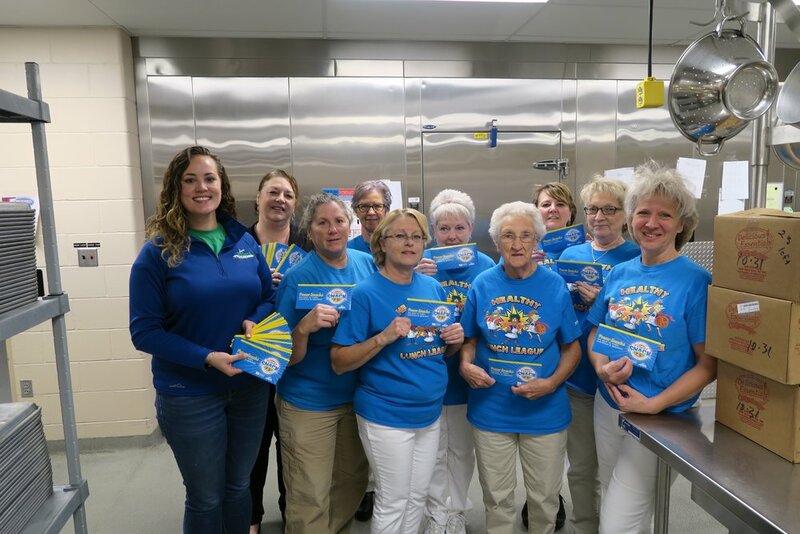 This year, Iowa Select Farms and the Deb and Jeff Hansen Foundation announced the expansion of their Power Snack™ program aimed at reducing childhood hunger in Iowa by providing access to nutritious food at home. This year, Power Snack™ will provide 23,267 children across 127 schools with 837,612 meals — a 23 percent increase from 2017. Thanks to the Power Snack™ program, at-risk children in rural Iowa receive a kit containing a $5 coupon for deli ham and a $3 coupon for a loaf of whole wheat bread — the ingredients needed to make their own “Power Snacks” at home. 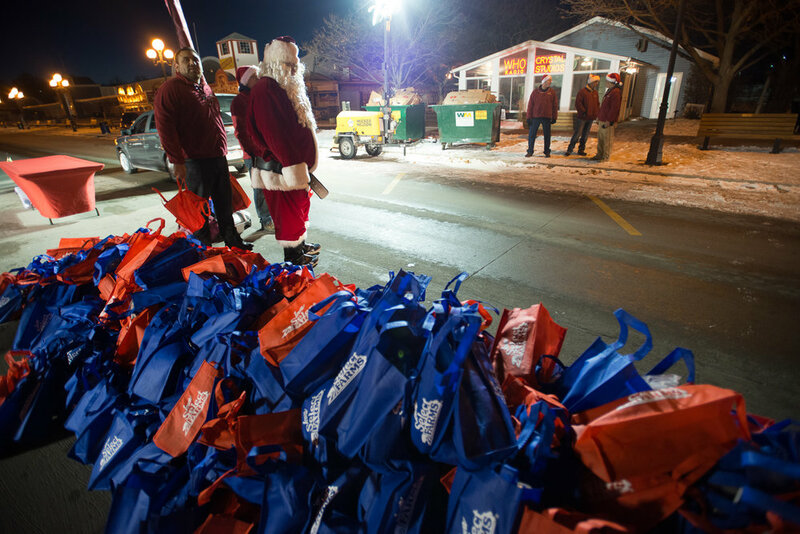 In addition, through Iowa Select’s Operation Christmas Meal they will donate 5,000 pork loins at the Des Moines giveaway on Nov. 30 at the Iowa State Fairgrounds, and then 1,000 pork loins at each of the 12 local stops across Iowa for a total of 17,000 pork loins. The events are intended for families who weren’t planning a holiday meal due to insufficient funds. On December 15, the company hosts its annual holiday party at Hansen Home for Hope. Santa and his elves put on a jolly holiday party for the Children’s Cancer Connection. Check out this fun, live video from last year. The holidays are a time to say a special thank you to Iowa’s 12,000 military men and women. Courtesy of Iowa Select Farms, every member of all Iowa military units receives $40 worth of coupons good for various pork products, equating to $480,000 in donated pork. They are also delivered to Iowa National Guard’s Survivor Outreach Services for 600 Iowa families of fallen soldiers. In 2005, Dennis and Connie Lundy of Fontanelle and the Greenfield United Methodist Church created the local Fields of Faith project. Through the project, approximately 70 acres of farmland are planted with soybeans solely for the purpose of helping others in need. Rolan Jensen (left) and Dennis Lundy stand outside Greenfield United Methodist Church in 2015. They are instrumental in bringing the Fields of Faith project to life each year. Photo credit: Joseph L. Murphy/Iowa Soybean Association. Everything – from the land to the seed to the harvesting – is donated. The grain is sold locally, and all the money is given to Growing Hope Globally – formerly known as the Foods Resource Bank – where it’s used to improve the growing and marketing abilities of farmers around the word. Since the project’s origination – marking 14 harvests this year – $436,000 has been donated to Growing Hope Globally. According to Lundy, the idea was sparked from an article he read about a grain donation program. It didn’t take him long to determine it could be done in his community. In typical farmer fashion, he went to work to make it happen. "What appealed to about this type of program is it's a place where we can use our gifts and abilities. Farming is a natural thing for us – we have the machinery, resources and know-how. It's a way to use something we do to help others," Lundy says. Last year, the farmers heard how Kenya West Pokot County in Africa has reaped the rewards of Fields of Faith. Two women from Kenya visited Iowa and shared the work they are doing and how Growing Hope Globally is helping small farms provide income and food for their families. Editor’s Note: During November and December, we’ll be highlighting other efforts of generosity through our Facebook page. If you know of a great story to share, which relates to the Iowa Food & Family Project’s mission, please contact us.